Camel, camel … who’s the fairest of them all? As if it’s not enough to endure the planet’s hottest and driest landscapes. As if it’s not enough to do it carrying 200 kilograms, walking 150 kilometers, day after day. With no water. And then taking just 10 minutes to quaff 100 liters and keep moving. As if that’s normal. All this our beloved mammal, the camel, has done for thousands of years. With grace. With poise. Even beauty. 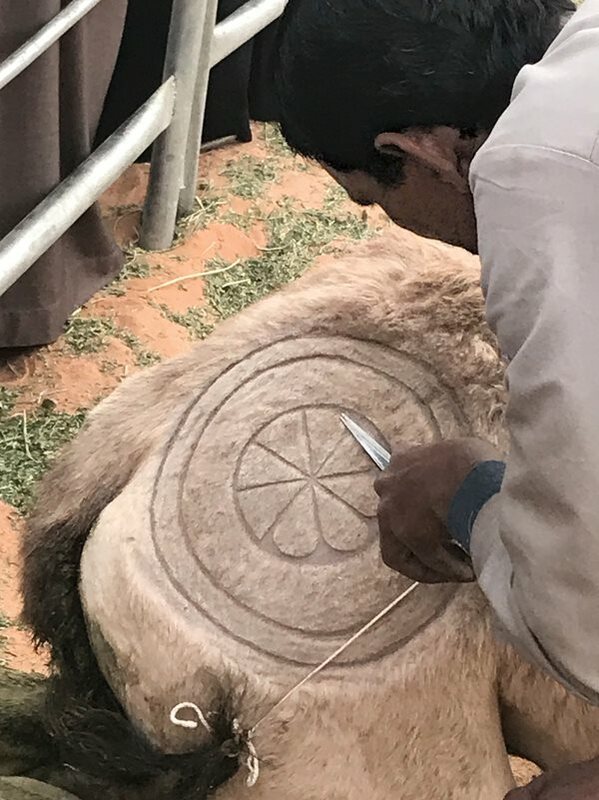 Sultan al-Buqami, spokesperson for the festival, points out that Arabs have a long tradition of making prominent decorations for camels on special occasions, especially for the head and neck, as well as chains, bracelets and plates of brass to be fixed along the camel’s nose. “A long neck. Big, droopy lips.” Camel owner Ehlal al-Shaibani tells me some of the traits that have him and his herd pocketing prize money at the King Abdulaziz Camel Festival’s annual furry, four-legged pageant. “The color of the camel is not important. That’s subjective,” he adds. Head judge Fawzan al-Madi says it’s mostly a matter of genes. But a camel can get only so far with tight genes. In some categories of the contest, judges eye not only looks, but also decoration. So get ready to bling your beauty beast. Here are a few ways to start. From saddlebags hand-woven in traditional patterns to tinsel-tassel costume-crystal necklaces—camel-sized—vendors at the roadside Suq al-Dahna also offer riding crops, straps, cinch belts, blankets, neck bells, foot bells and, above, plastic flowers to add flair to any pretty nose. First, know there are no factories making camel bling. You can’t order this stuff online. All items are handcrafted, and the cost of fully fitted camel gear might cost as much as, say, remodeling your kitchen. Well, not always, but close. A good place to start kitting up is the Suq al-Dahna. This is the camel-oriented market set up along the road near the King Abdulaziz Camel Festival. 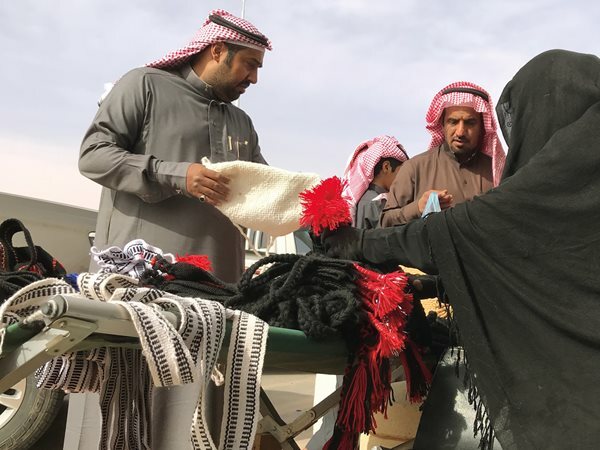 Families are given a stall space for free to sell handcrafted camel accessories. Not a designer label for 120 kilometers. It’s the place. Necklaces are the most obvious and literally in-your-face of camel decorations. You might choose some big, elaborate creations made from multicolored braids. Look for ones that have the most ornamental accessories such as shells sewn in. Hang them from the camel’s head like rainbow dreadlocks, and make sure you get them long enough to almost scrape the sand. 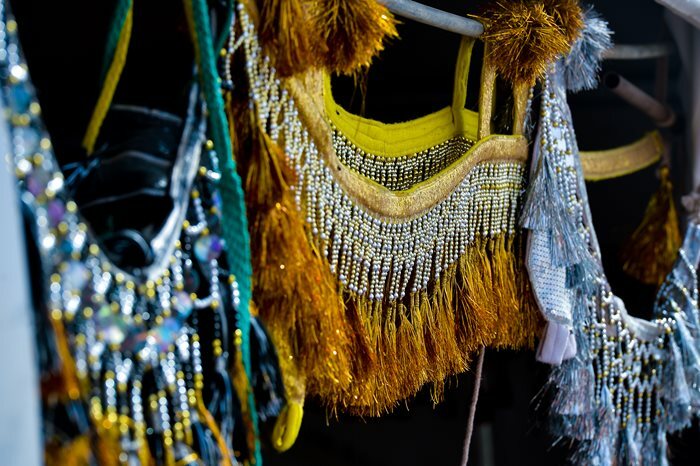 Or get some with luxe cotton pom-poms, tassel mirror charms that sparkle in the sunlight, and all manner of hundreds of silky threads in a kaleidoscope of colors. Remember, we’re not going for subtle here. So now it’s time for a bell. As you might expect, this goes on the neck. It is wrapped with wool dyed with many colors, shaped like a large knot. There is no clapper, so it makes no sound. This is just for adornment. Get a big one. Trimmed, shaved and cut again, camel-hair art is often practiced for special occasions. Ankle sparkles, and how about an Elvis quiff? For both sparkle and sound, try a quartet of anklets. 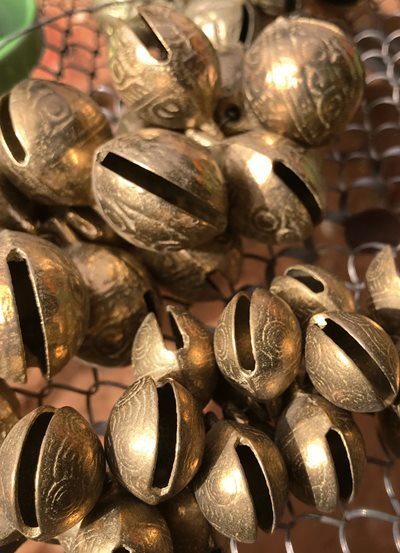 Most are cast out of brass, and their jingle will make your camel sound like a desert sleigh ride. Then go visit the men with scissors, and don’t ask for just a trim. These artists could make Vidal Sassoon swoon with the intricate designs they can cut into a coat of fur. How about a stunning mandala? Geometrical patterns to run chest to tail? Four sticks, two sticks, no sticks, forked sticks? Of course, your pretty-faced, blinged-up camel won’t be much good for riding until you saddle up. Custom saddle versions start around $3,000. Look for one with light chrome, high-density foam, nylon, webbing, leather and felt pads. (An antique one would use wood, iron, leather and grass stuffing.) Choose a sporty two-stick saddle for speed and simplicity, but it requires tricky rigging, and you don’t want to hurt your camel. A four-stick saddle sets you up more like a camel suv: a lot more baggage and supplies, easier to load and unload, and good balance. One of these on your camel’s hump will literally raise your bling factor a couple of serious meters. A two-seat howdah that updates a very old, transverse saddle design often used for women and children. Unless you add a roof. 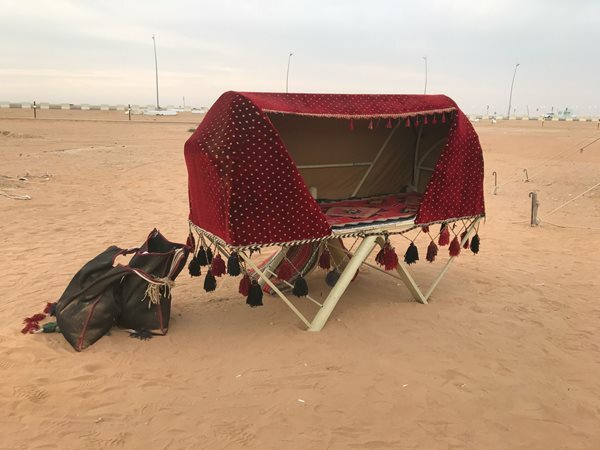 The iconic howdah is a seat that provides canopy and accommodation for two or, cozily, even more. Riding a howdah must have truly felt like being aboard a ship of the desert. Negotiating at the Suq al-Dahna. A camel can be a hard beast to ride at the best of times, so people have made the job easier with reins and more to keep camels on the straight and narrow. There are many with stunning designs made from dyed wool, camel hair and even horse hair. Your camel’s front and rear can be draped with dababeeb, wool or tightly woven fabric placed on the back of a piece of woven wool cloth called al-shamalah. Down the sides of the camel, from each side of your saddle, hang al-safaif, your two-part, multicolored wool cinch belt that ties down and around the camel’s stomach. This you can have embroidered and adorned with multicolored metals and lashes. Ready to stride? Time to hit the sands? Just be ready—there’s a lot of competition out there. Beliz Tecirli earned her Ph.D. from University College London studying the social impacts of cultural creative industries. She has worked for both the Museum of London and the King Abdulaziz Center for World Culture in Dhahran, Saudi Arabia. Her interest in sustainable heritage preservation led her to establish Lapel Atelier, an online business devoted to hand-crafted men’s boutonnieres using crochet traditions.